To all the Madames: Balima’s Croque-Monsieur is the new man of your dreams. Fluffy, dulcet bread topped with velvety baked cheese (ham or turkey) will have you begging for a second date. Rich and delicate to the palate, and best served with mustard spread, this monsieur will never disappoint. Comfort food at its best, your stomach will be singing sweet songs of love. Even McDreamy can’t dare to compare. The wait staff on the other hand, generally embody the McDreamy antichrist. Frequently non-responsive, the concept of customer service has not yet landed on Balima Island. Forget them, nothing should stop you from enjoying your man. Except maybe, their soups of the day…Garden-fresh, spoonfuls of heaven like the Shrimp Corn Chowder make for a delightful meal on a cold day (a heavy compliment coming from a Bostonian!). The only café in Saifi Village, Balima is home to Posh Nation. Goes to show, sometimes love is found in the most peculiar of places. Trivia Night is the golden egg of the Greedy Goose resto-pub nestled on a dim-lit corner of Monot. Every Monday night, at approximately 9-after-dark, teams like The Snozberries, Decepticons, and Stop-This-Quiz-I’ve-Got-to-Wee, gather in the English old stone pub to eat, drink, and compete for trivia master titles. A wide range of topics are tested; from album covers to biology to cinematic history. The word “Trivia,” originates from its Latin parent, “Trivium,” meaning “where three roads meet.” Consequently, all paths cross at the Greedy Goose. However, it takes true brit to contend! To go along with a fine course of Trivia, the Lamb Burger with Strawberry Sauce is a scrumptiously juicy selection, washed down with their Ecusson Cider–makes for a truly classic experience. Forget the ordinary appetizers, their Stew of the Day will most likely knock you senseless. Beware, this Goose is Greedy indeed, and your wallet will suffer the consequences. Coop D’Etat may not be the stomping ground for your local Sons of Anarchy, but its rooftop refuge attracts the most amusing international bunch. Foreign professors and students alike gather to indulge in backyard-barbecue under the Beirut sky. Chow tasty homemade hotdogs, burgers, and beer, on simple tables lit by one giant billboard and colored lights. Coop D’Etat rests atop the Saifi Institute for Arabic Language; down from Gemmayze and just above the Autostrad. You might even happen upon a night of live music. All beware, Coop D’Etat’s bar is short and its tables fill quickly! If the weather permits, welcome into your weekend this bohemian nook! No one speaks Smoked Salmon Tartar like Cassis Bistro & Bar on Uruguay street. A perfectly-sized treat, sprinkled with pomegranate seeds and served on beet carpaccio. Wow, I loathe beets… but lo’ and behold Cassis, I now love beet carpaccio. Monday through Sunday, Cassis packs em’ like sardines. No reservation, you’re sitting at the bar. Don’t worry, the bar isn’t such a bad place. Paul the bartender will tell you so. Fresh drinks and pleasant picks of wine by-the-glass–a hard thing to come by in Beirut (we obviously don’t like drinking in single servings). Cassis even has a delectable non-alcoholic fruity cocktail selection that’s ACTUALLY on the menu. Drumroll…Cassis, you have the best Quinoa Salad yet! It’s that nitty gritty grain-like substance that requires special care to master. Should it taste soapy or sloppy, it becomes the peasant meal that it is (think “bulgar”). When cooked to perfection, it becomes a divine Fair-Trade delicacy. Expect all intimate conversation to end by 10:30, when the music goes nuts. Tel: +961 01 989811. Call ahead for reservations. Uruguay street (behind An-Nahar building), Downtown Beirut. During the good college years, I spent a fall semester abroad on Chemin du Fort Benoit, in Besancon, France. My wonderful house-host, Ina, spent the fall cooking delicious dinners. One of her favorite recipes being this quick & easy Quiche! Fresh rosemary/fresh basil leaves or both! Use one large pan or two! 1. Preheat the oven to 350°F or 175°C. Carefully press the pâte feuilletée roll(s) in the lightly-oiled pan(s). 2. Spread about half a teaspoon of Dijon mustard over the bottom of the crust. Then, fork several holes around the base of the crust. 3. Slice the tomatoes into moon-shapes. Then, slice the chevre log (as-is). Place & alternate the tomatoes & chevre along the bottom of the crust. 4. Finely chop & sprinkle the onion evenly over the tomatoes & chevre. 5. Cover the tomatoes, chevre, and onion with the basil leaves (if you have any). 5. Whip together the eggs, milk, & cream; adding the salt, pepper, and rosemary. 6. Pour the egg & milk mixture into the crust(s). 7. Evenly cover the quiche with grated parmesan cheese. 8. Place in the oven for around 35 minutes or until top/crust is golden brown. BON EATS! DIOS MIO las fajitas mexicanas de Joe Peña’s are top in town! Yes, some cool cat named Joe actually labeled his restaurant, “Joe Rocks.” Wait a minute, that’s just his name. Yes, it’s an undercover restaurant chain, and cool Joe will empty your wallet before the night is through. Sadly, it’s so worth it. 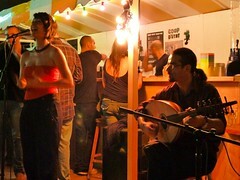 Tucked away on a side street of Gemmayze, Joe Peña’s hip milieu brings together a different crowd every night. Let’s start with the 17,000 LL Guacamole. The first time I ever paid about $12 for Guacamole was at Joe Peña’s. It’s like paying $12 for Foul. For the record, Guacamole is not so exotic, it costs pesos to make-it-yourself at home (even in Beirut). Confession: I still order it every time. If you like reading books, pick up Joe Peña’s drink menu, and sing your cocktail ABC’s. Margarita pitchers & fine Caipirinhas aside, Joe Peña’s also makes a mean Mai Tai. Gettin’ to the gold: Try one of the more daring fajita mixes such as the Chicken, Banana & Coconut, the Beef & Pineapple, or the Camarones (Shrimp) & Chicken. However, prepare your stomach because these bad boys are fillers. One order of Fajitas is suitable for two. Tel: +961 01 449906. Call ahead for reservations. Open Sunday-Tuesday 5pm-1am, Wednesday-Saturday 7pm-2am. Kitchen closes at 12. London Fog: If you’ve ever desired a drink of heavenly vanilla, creamy milky-fluff…this one’s for you. The London Fog/Earl Grey Tea Latte/Grey Tea Misto hails all the way from Vancouver, British Columbia. Reminiscent of winter days at my favorite L’Aroma Café in Boston, I was ecstatic to see Second Cup‘s adoption of this soul-warming indulgence. Subsequently, I joined forces with Team Second Cup and we brought to refinement the first proper London Fog of Beirut. Thereafter, I became a regular, and Second Cup on Raouche became the Official House of London Fog. Address: Raouche street (General de Gaulle), Bahri Gardens 2 bld.